There's a good number of emails that get archived in my inbox, but every once in a while, there's a brand that presents itself well enough to warrant a review. This week, that brand is Fly Barbershop. Their jar really caught my attention. That red is just so beautiful. Their No.2 is marketed as a medium hold matte finish pomade, whereas their No.1 is a strong hold. There are a myriad of strong hold gel-pomades on the market, so with that saturated to the high heavens, I figured we should start with the medium one. Something more balanced. This was the reason why I decided to review them without a recommendation from another well respected home brewer. That red color is gorgeous. It's far from flat. It gets a unique vibrancy from the metallic jar, which really just makes it pop. The font choice and layout accentuate the color well. On a practical note, the jar is 3 oz. Also, I just realized what really clicked about the jar for me. The aluminum sheet metal feel really latches on well to the brand concept -- a throwback to vintage planes. The aroma is hard to describe because it lacks any herbal or sweet notes to distinguish it. The smell is cologne-like. It's almost like something The Daimon Barber would conjure up but just not quite as exotic. Scoops like a jelly. You can really see how that leftover shape comes through in the photo of the inside. It's super easy to apply as we would hope from a medium hold gel-pomade. The grip may pop its head out a bit as you apply, but it's definitely not enough to bat an eyelash at. Truly a matte. I really appreciate it here that Fly Barbershop is honest and chooses to embrace the reality of gel-pomades. All the time, these labels advertised their gel-pomade with high shine and more often than not, they don't even. If they do, it only lasts for an hour or so. They made a good choice to just embrace it and make it intended. It's slightly less than we would see from a sticky gel-pomade. That means you'll get a few strays. You can choose to either use water to reactivate a small portion to help it set in, or it may be enough to just touch it back into the rest. Either way, it is slick enough to style a clean but matte pompadour. I think the big thing to note is that though it's matte -- it's doesn't push the user to texture up their hair. You should have seen in the video that the styling process was both effortless and fast. At this point, we shouldn't expect anything less from a gel-pomade. Since there's so many choices, we should only bother with the best of them. It surprisingly didn't do too bad at all and especially given that it's a medium hold. I had a pretty relaxed day, so I would have been very disappointed if it all fell apart. Some parts fuzzed out, but the pomp overall stay together well. You will have a difficult time trying to restyle without water. While the lack of stickiness makes things feel much cleaner, it makes it dependent on water to reactivate its styling capabilities. Yes. It's definitely a gel-pomade. Nope. While it may give a matte finish, my hair doesn't feel excessively dry. 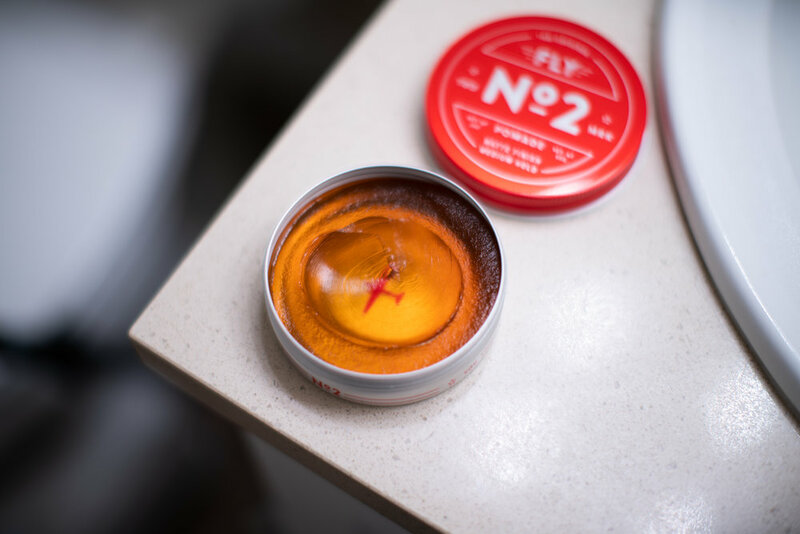 Fly Barbershop has created an elegantly balanced gel-pomade with No.2 by formulating something that is well-balanced and optimizes on the natural characteristics of a gel-hybrid. Instead of pretending to be something it's not, I think this is one of the more accurately and honestly advertised gel-pomades I've used so far. I admire that. Plus, it doesn't hurt that these characteristics are quite a perfect match for my hair type. For that, it receives my Seal of Approval. While it doesn't break any boundaries or innovate, it does what has been done before but picks and chooses the right performance characteristics. For more information, you can check out there offering by clicking below.